Do You Know? Internet millionaires don’t acquire their wealth and success by luck of the draw. They know the secrets to success. These secrets are so valuable that if you implement them, you will succeed in your own Internet business. There are two general types of secrets that Internet millionaires know which include external and internal secrets. 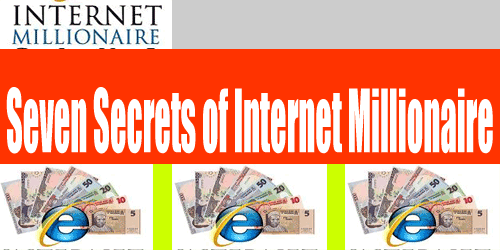 We will discuss these secrets in detail in hopes that you will use them to your advantage and become an Internet millionaire yourself. First, let’s look at the external secrets that Internet millionaires have in their toolkit. Internet Millionaire Secret #1: Internet millionaires recognize that strategy should be the foundation of any marketing plan. It is critical to have a marketing strategy and not just jump into marketing techniques. For example, we don’t have to use mass advertising anymore because mass advertising doesn’t have strength because consumers have choices. You would have wasted valuable time and money if you used mass marketing techniques without first strategizing about the state of the market. Internet Millionaire Secret #2: Internet millionaires are not generalists. They focus on selling their products and services to specific niche markets. The business market, in general, is going in the direction of niche markets because customers have more choices regarding places to buy their products. Internet Millionaire Secret #3: Search for and grab untapped markets. Seek out people that have not been able to have access to your product in the past. In untapped markets, you don’t have to deal with competitors which helps keep the marketing costs down. In addition, you will be able to establish a rapport and trust with your customers. Internet Millionaire Secret #4: Your backend strategy is crucial to success. You want several profit centers that allow you to sell your products and services to more customers. The backend part of your company supports these profit centers. It diversifies your business, so you are bringing in money through many different areas. You can’t rely on retiring early if you only have one profit center. Internet Millionaire Secret #5: Try to automate as many services as possible. This will allow you to sell services 24 hours a day 7 days a week online. Automate your service centers to cut down on costs and help your customers at all hours of the day. Internet Millionaire Secret #6: Set up your business so that you are replaceable. You can make yourself replaceable by branding. Branding encompasses you or the value that you provide. Branding yourself is lucrative, but it doesn’t allow you to take a break because you have to make every decision. Branding your value, on the other hand, sells your expertise and not your time. Internet Millionaire Secret #7: Don’t work alone; build a team to support your business venture. Create a team of marketing, business, a mentor and accountability individuals. Remember, two heads are better than one so you can discuss ideas and strategies you have for your business. Internet millionaires also have internal secrets. An Internet millionaire has self-confidence and believes in their product. They can make decisions quickly. They have learned the correct information and modeled others that have proven a success. 1 responses on "Seven Secrets of Internet Millionaire"